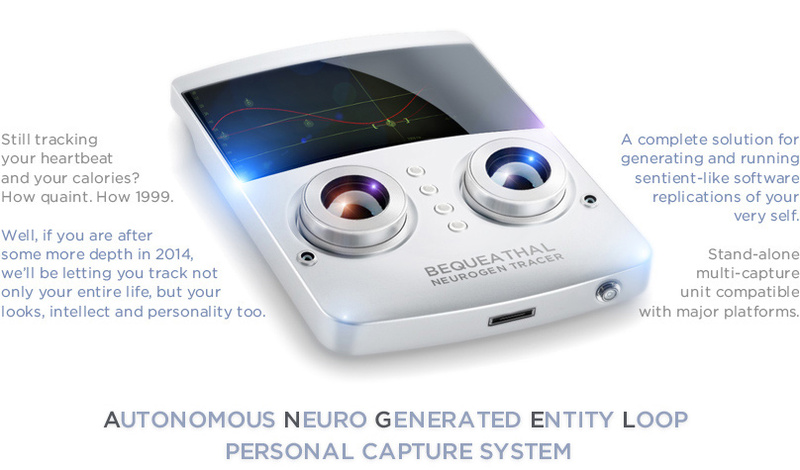 Neurogen® tracer is our first hardware product aimed at extracting and virtualizing individual characteristics of a user. The unit is wholly self-operational and does not require additional hardware or computing resources, bar the internet connection, although it can utilize Intel CPUs for supplemental processing if connected to a Windows or Macintosh computers. Each tracer stores, processes and hosts the entire content of its capture, outputting the results in real-time via a network. Digitized output combines visual rendering, vocal synthesis and neural logic in its actualization and is fully immersive with capacity for life-like reaction & response times. Only the actual users can setup and change the instructions of their entity loops due to multi-encrypted security implementation which involves previously stored visual, audial, physical and other personality traits. Autonomous Neuro Generated Entity Loops are sometimes also reffered to as Afterlife Neuro Generated Entity Loops, or ANGELs.